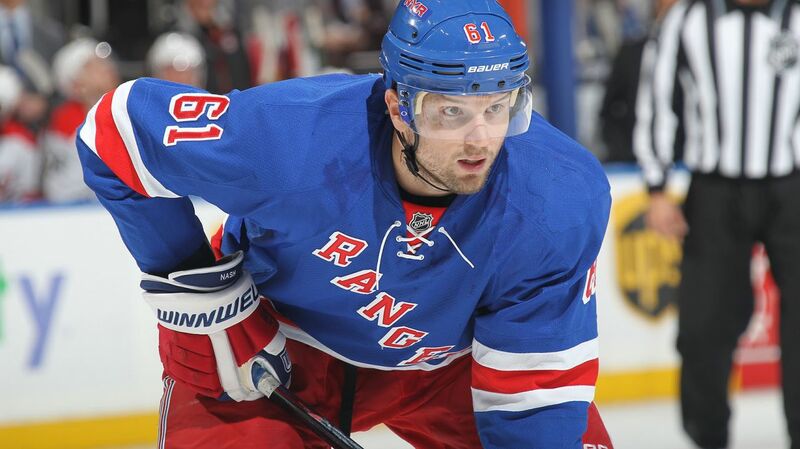 Rick Nash is the Rangers most dangerous player, leading the team with 18 goals and 28 points. Photo courtesy of MSG Photos. After playing just three games in the past 15 days, a well-rested Rangers (12-10-4) is looking forward to taking on the Vancouver Canucks (18-9-2), who are coming off of a seven game road trip of their own. The Rangers have not played since Monday, where they defeated the Pittsburgh Penguins in overtime by a final score of 4-3. After struggling for parts of the season, the Rangers are hoping that their first extended road trip of the season will help them find some consistency and their hockey identity. Alain Vigneault is also returning to Vancouver, giving the team an extra incentive to win. The Canucks are returning to Rogers Arena for the first time since November 25th, just finishing up a seven game road trip with a 3-1 loss to the Montreal Canadiens. The Canucks finished the trip 3-3-1 after winning three of their first four games. The Canucks are also a strong team at home, with a 7-3-1 record, but are just 3-2-1 in their last six at Rogers Arena. Last season, the Rangers were a very impressive road team, winning 25 games away from Madison Square Garden (25-14-2). This season, they have not had the same success, posting a 3-5-1 record on the road this season. Both teams will be looking to earn an important win this season, with Vancouver winless in their last three games (0-2-1) and New York aiming to build consistency. Ryan Miller was the big offseason acquisition for the Canucks, and he has been very good, posting a 16-6-0 record with a .905 save percentage and a 2.57 goals allowed record. Former Ranger Derek Dorsett will play tonight after missing yesterday’s practice. Dorsett is off to a good start this year, with 10 points (4-6-10) so far. Rick Nash is the offensive force for the Rangers. Nash has points in eight consecutive games, and leads the team with 18 goals. Derick Brassard and rookie Kevin Hayes are riding four game point streaks of their own. Derick Brassard has been another one of the Rangers best players. 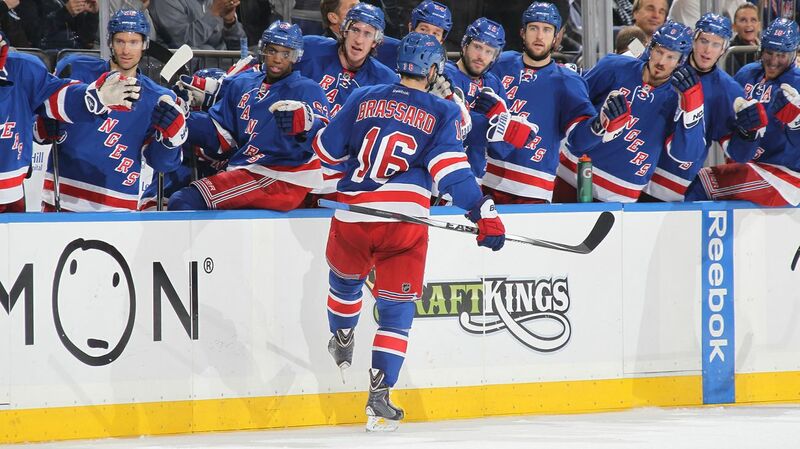 Brassard has accepted the top line center roll, putting up 22 points (8-14-22) in the Rangers first 26 games. Photo courtesy of MSG Photos. Chris Kreider is the Ranger to watch tonight. Kreider has not scored in 11 games, and with the recent success of JT Miller, was bumped down to the Rangers fourth line. I expect a hungry Chris Kreider looking to regain his spot as a top six forward. The Rangers will take on the Canucks in Vancouver at 10 PM. The game will be broadcasted on MSG Network. Posted on December 14, 2014, in Game Previews and tagged Alain Vigneault, Anthony Duclair, Carl Hagelin, Chris Kreider, Dan Boyle, Dan Girardi, Derek Dorsett, Derek Stepan, Derick Brassard, Dominic Moore, Henrik Lundqvist, Jesper Fast, John Moore, JT Miller, Kevin Hayes, Kevin Klein, King Henrik, Madison Square Garden, Marc Staal, Martin St. Louis, Mats Zuccarello, Matt Hunwick, MSG, New York Rangers, NHL, NHL 2014-2015 Season, NY Rangers, NYR, Rangers Nation, Rangerstown, Rick Nash, Ryan McDonagh, Ryan Miller, The Duke, The Ranger Zone, Vancouver Canucks. Bookmark the permalink. Leave a comment.